Priyamvada Natarajan at Yale University’s Beinecke Rare Book & Manuscript Library, where she often goes to look at old maps. 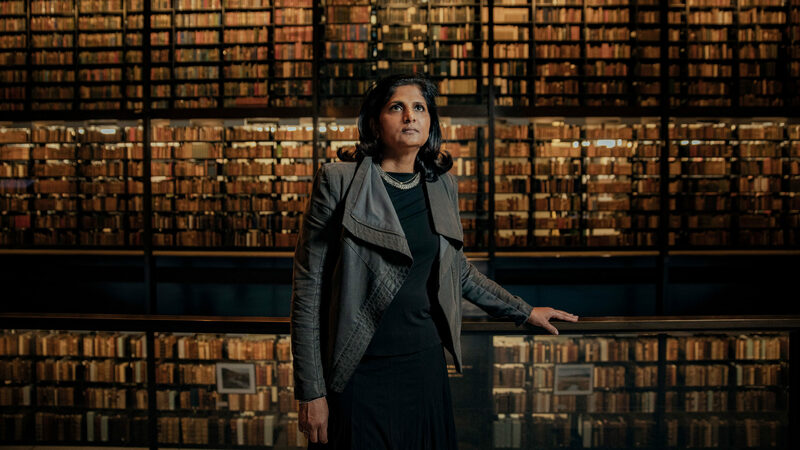 Priyamvada Natarajan is a leader in the effort to map the universe’s invisible contents, which is to say, almost everything. Ninety-five percent of all stuff takes mysterious, nonluminous forms dubbed dark matter and dark energy, which betray their presence in the cosmos by attracting and repulsing, respectively, the 5 percent of stuff that’s visible. Even that 5 percent is increasingly slipping out of sight, as stars and gas tumble into gargantuan black holes at the centers of galaxies. Natarajan, a theoretical astrophysicist and professor at Yale University, creates maps of where dark matter is clumped and how dark energy stretches space. 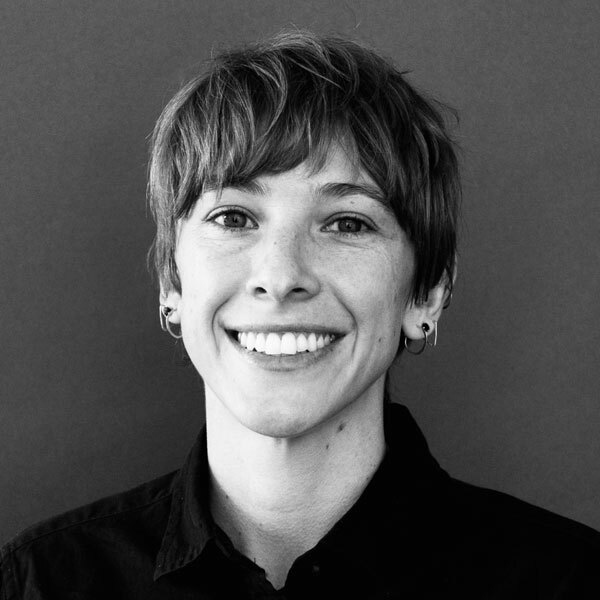 She also models the growth of those supermassive black holes and helped develop the leading theory of their formation in the early universe — a theory that will be tested by telescope observations in the near future. In a recent interview in her office in New Haven, Natarajan said she’s drawn to maps because they encode what’s known, and what’s unknown, at a point in time. “These abysses you know nothing about — that’s also written out in a map; they tell you, ‘terra incognita,’” she said, pulling up j-pegs of old maps she likes to visit across campus at the Beinecke Rare Book & Manuscript Library. She has been mapping and modeling modern cosmology’s terra incognita, especially dark matter and supermassive black holes, since her student days at Cambridge University in the 1990s. After playing a pioneering role in those pursuits, she landed a professorship at Yale in her late 20s and has been based there ever since. She is also a professor at the University of Copenhagen and an honorary one at the University of Delhi. 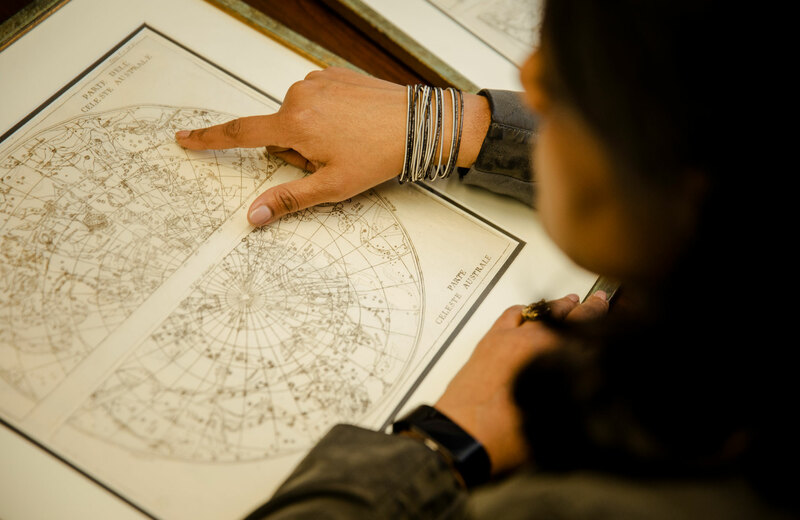 A member of the Royal Astronomical Society, American Physical Society and the Explorer’s Club, and a published poet, Natarajan has received many fellowships and awards, including several from her home country, India. We talked for three hours in her Yale office, surrounded by reproductions of abstract art — Rothko, Matisse, Louise Bourgeois — which she calls her “major, major love.” An edited and condensed version of our conversation follows. Your 2017 book, Mapping the Heavens, narrates the quest to map the cosmos from ancient to modern times. I gather that your own path began with a map. Yes. I grew up in India. My parents are academics, so I grew up around books. I loved science and math. But I was also interested in history, writing, poetry, art. My parents provided me with advantages that made a big difference. My dad bought me a Commodore 64 before people in India knew what a personal computer was. My parents had also given me a telescope and microscope; I picked the telescope. I was part of an amateur astronomy club, and when I was 15, the director of the Nehru Planetarium, the astrophysicist Nirupama Raghavan, came to speak to us. I told her I had a computer and asked if I could help with her research. So she said, “What are you interested in?” The thing that I have always been crazy about is maps. Celestial, terrestrial, any kind of map. A 17th-century map of the sky that Natarajan purchased at auction in Rome. So she said, “Why don’t you write a program to plot out the sky map that you see in the newspaper every month, produced by the astronomical society of India?” So I went home. It was a really hard problem; she told me later she didn’t think I would come back. I had to teach myself spherical geometry. I worked like crazy. Six weeks later, I figured it out; my program worked. So I went to see her. I showed her the sky maps I had made, and basically her jaw dropped. Then she said, “OK, this is very impressive, but what if you go to Boston to study, and you want to look at the stars and planets?” I said, “Oh, I sorted that out. The way I’ve written the program is you can put the latitude and longitude of anywhere on Earth.” At that point she had a conversion moment; she became incredibly supportive of me. I would do computations for her. So I got my first taste of research. You received a scholarship to MIT. Did you know what you wanted to study? I wanted to be a physicist, no question. But I wasn’t sure which area. I finished all the graduate courses in physics by the time I was an undergraduate, and I did a math major as well. So I was ready to do research at that point. I started working with Alan Guth on thermodynamics of the early universe. I was thinking maybe particle physics. I didn’t want to do string theory because I wanted to make a connection with the real world. So I applied to graduate school in physics, but I was undecided, so I deferred. You then started a Ph.D. in the philosophy of science, which you wanted to pursue in conjunction with physics. Why? I wanted to be the kind of person who does cutting-edge science and also thinks deeply about the process of science. I was going to be both the insider and outsider. This is a theme that has haunted my life, always, in every which way — personal, emotional, psychological, scientific, intellectual. This feeling of being an outsider and occasionally feeling like an insider. The conflict. Why do you think you feel that way? Being female; being brown; being interested in physics; being highly intellectual in this particular way. And because of the cultural transitions that I had made. One of my professors, Evelyn Fox Keller, put it very nicely — that it took me a very long time to find my tribe. I didn’t feel lost, but I felt alone. I still feel it in a lot of ways. There are situations in which I really feel that I don’t belong. And re-entering the same setting at another time, I have felt completely at ease, and I feel like I belong. It’s very weird. I think it’s a deeply psychological thing. I left home very young. And there was this real need to want to be connected. How would you describe your tribe? People who have many serious interests that they intellectually engage in. People who are not solely careerist. My game — cosmology, dark matter, black holes — has a very particular competitive culture that I don’t fit into. But thankfully this is the thing that time does. If you stick with it, you do good work, then you don’t have to conform; you can eventually just be who you are. I always felt that I had a very special clarity of mind because I knew what I wanted out of what I was learning. I want a certain depth of understanding that comes with people who think mathematically. I am attracted to certain very particular kinds of abstraction. We all have our pet things that somehow we gravitate toward, and for me it’s always been these invisible entities: black holes, dark matter, these things that are almost at the limits of our knowledge. All physics breaks down when you reach the edge of a black hole. So it sort of seduces me. These are the things that really push us as scientists: How can we model them? How do we think about them? And as we know more: How can we refine our model? When you improve it, does it mean the thing you had before was wrong? How is a model related to reality? That was going to be the theme of my philosophy Ph.D.: How do you build knowledge? 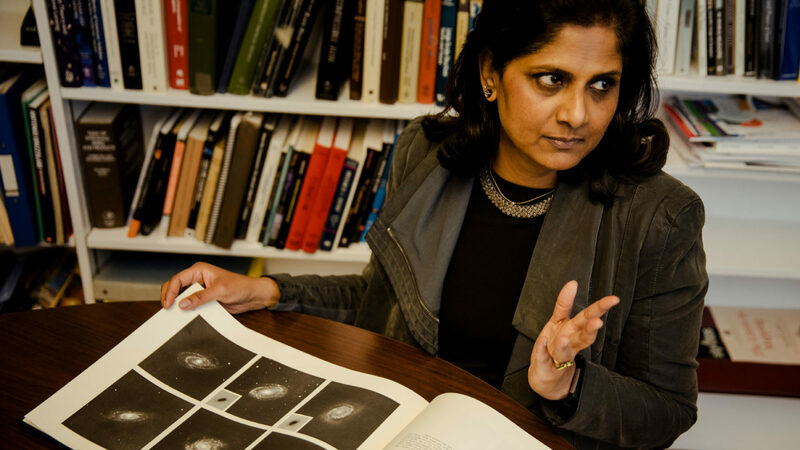 Video: Priyamvada Natarajan explains the role of supermassive black holes in the structure and evolution of the universe. You decided not to continue with philosophy once you began your Ph.D. in astrophysics with Martin Rees at Cambridge. What drew you to him? What he did was model. He made models for black holes, gamma-ray bursts, galaxies. Anywhere there was an exciting observation that needed an explanation, you could just build a model. So that was the perfect intellectual match for me. At that time the observational data of supermassive black holes was just starting to trickle in. So we were building storylines for how to grow a black hole and so on, and there weren’t too many fences. There was a little bit of observational guidance, but you could run a little wilder with the models. Black holes maybe weren’t as conceptualized as they are now. They were conceptualized and thought about, but their role was not seen as so central. Now we know that they seem to really be shaping galaxies. So they’ve moved to center stage. They’re crazy objects, no question; they’re bizarre. There are three ways to think about them, and you can choose. One way is that stars, when they exhaust their fuel, have a violent end, and they leave behind — like a dead nuclear reactor — these black holes. So black holes are compact inner parts of the stars that have gravitationally collapsed and have become unbelievably dense. There’s no analogue. It’s not lead; it’s nothing we can think of. Then these stellar remnants build up. Gas falls in. They become bigger. Another way is to think about the fact that not even light can escape from a black hole. If you want to launch a rocket that has to escape the gravitational grip of the Earth, we have to shoot it out at 11.6 kilometers per second. That’s 33 times the speed of sound, so it’s pretty fast. Now imagine a rocket going out at the speed of light, 300,000 kilometers per second, and it still can’t escape, because the gravitational grip is so strong. That’s a black hole. And we’ve gradually realized that supermassive black holes are vital to galaxies? Yes. My thesis started the work of trying to work out that relationship. What had just been observed was that there’s a correlation between the mass of the stars in the inner part of a galaxy and the central black hole that it hosts. That suggests that somehow the formation of galaxies and black holes is intertwined. We were developing the early framework for how to tie together their growth. It was very exciting, because you could build simple models that could make really powerful predictions. Then, over time, these models got more and more sophisticated because you got more data that constrained you. I worked on that, and also on gravitational lensing — the bending of light by dark matter. The Hubble Telescope gave us these amazing lensing images that you could analyze. You could indirectly map the presence of dark matter from the amount of stretching that you see in light from different galaxies. So the limits of our knowledge today, the terra incognita, is in that Hubble map. 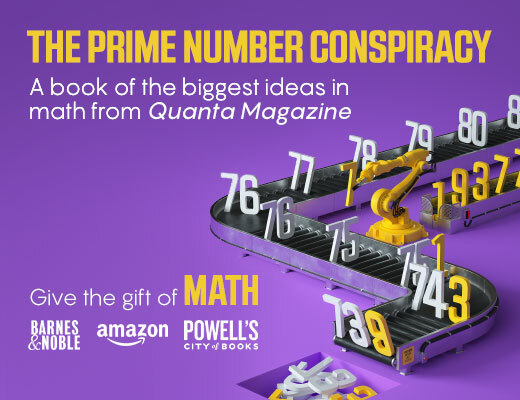 My original contribution was figuring out a mathematical mapping that would allow you to pick out the little clumps of dark matter. What we found is that the dark matter clumpiness in the universe matches extremely well with expectations for “cold” dark matter — the noninteracting kind. 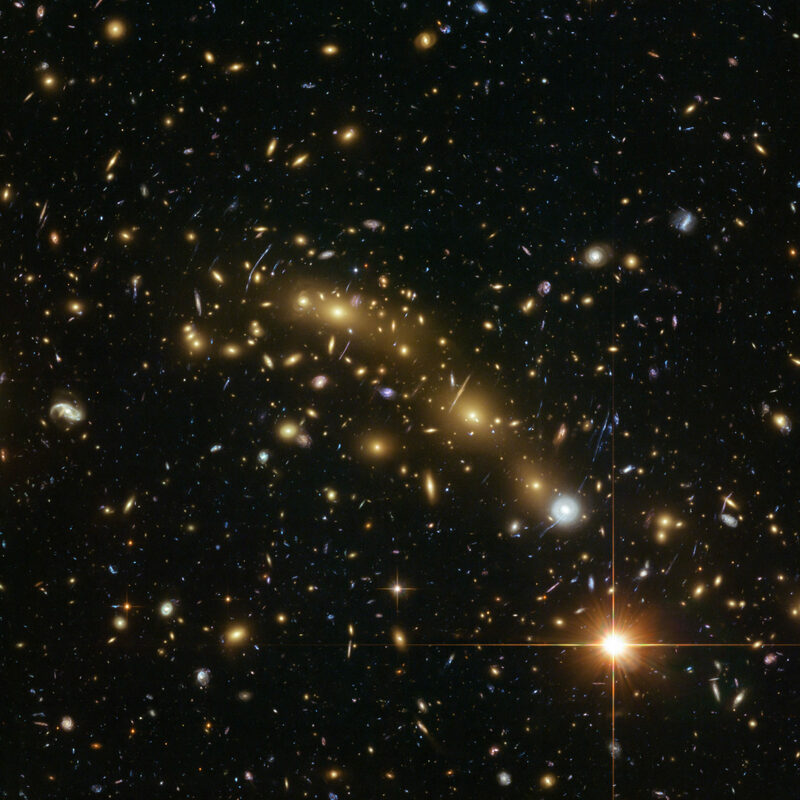 A Hubble Space Telescope image of the galaxy cluster MACS0416. 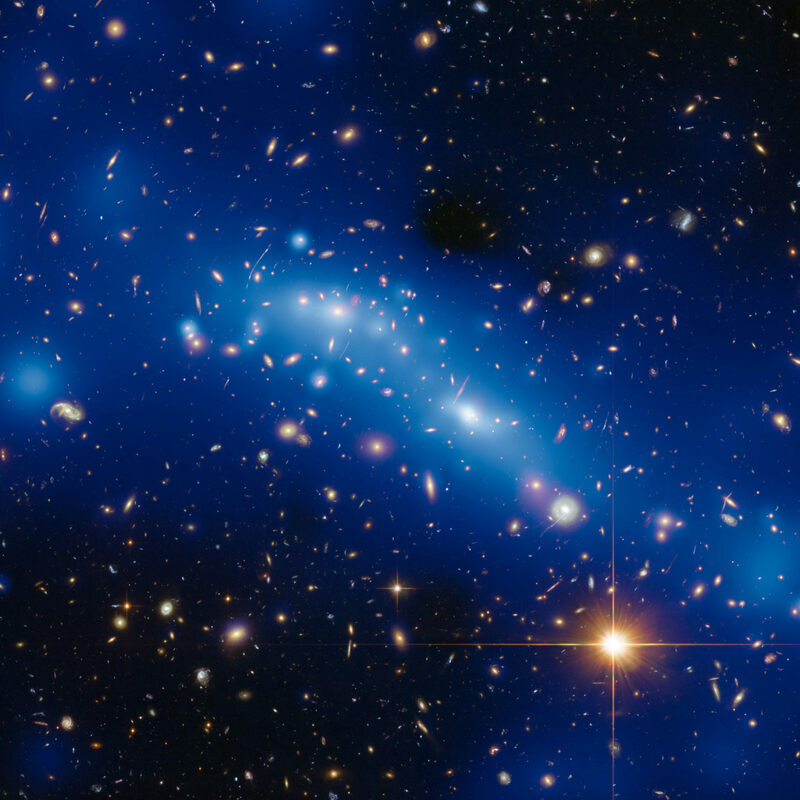 Galaxy cluster MCS J0416.1–2403 overlaid with the distribution of dark matter, shown in blue, that Natarajan and her colleagues inferred from the distortion of light from distant background galaxies. A Hubble Space Telescope image of the galaxy cluster MACS0416 (left), and the same image (right) overlaid with the distribution of dark matter, shown in blue, that Natarajan and her colleagues inferred from the distortion of light from distant background galaxies. Courtesy of ESA/NASA/Hubble, HST Frontier Fields J. Lotz, M. Mountain, A. Koekemoer and the HFF Team (STScI); Courtesy of M. Jauzac (Durham) and J-P. Kneib (EPFL). At Yale, you started studying how supermassive black holes might have formed in galaxies’ centers in the first place. First explain what the puzzle is. As we got better and better telescopes, we started finding these bright quasars [luminous galactic centers] powered by billion-solar-mass black holes when the universe was 10 percent of its current age. That was a huge mystery. The first stars were forming at around the same time, so you don’t have enough time for a stellar remnant, which is at most 100 times the mass of the sun, to grow to a billion times the mass of the sun. In 2005, 2006, I wrote the first two papers with a postdoc of mine on “massive seeds.” Our paper said you can bypass the formation of a star and form a very massive seed black hole — about 10,000 to one million times the mass of the sun — to explain these quasars. The simple idea is you’re in a bathtub and you pull the plug; you see the water going into a vortex. Something very similar happens in the early universe with gas disks. An instability occurs — the equivalent of pulling up the plug — and gas siphons very rapidly into the center. What we did was to integrate these “direct-collapse black hole seeds” into the larger cosmic picture, following a population of black holes — as they form, evolve, become quasars, turn off, shine — until today. It’s paradoxical that we have a theory, the “standard model of cosmology,” that perfectly captures the evolution of the universe, even though 95 percent of its contents are unknown. How do you explain that to people? Suppose you are on a beach, looking at the sand dunes. They dissipate, re-form, get swallowed by the ocean. The dynamics of how the sand dunes evolve is something that you understand very well because you understand the wind and the water. But you don’t actually know what a grain of sand is made of. That’s where we are at the moment. Astrophysics can tell you the granularity of dark matter, how dark matter clumps. That gives you some understanding. It rules out candidates. It’s like saying that the grains of sand are not rocks; they’re not pebbles; they’re very fine. But what the grain is made of is going to come from particle physics experiments. You prefer the level of sand dunes rather than the fundamental level. Yes. That said, a mismatch between theory and observation at the astrophysical level might point the way to some fundamental ingredient that is missing in your theory. The hierarchy of what’s fundamental, secondary, what is deeper — the layers get mixed up. 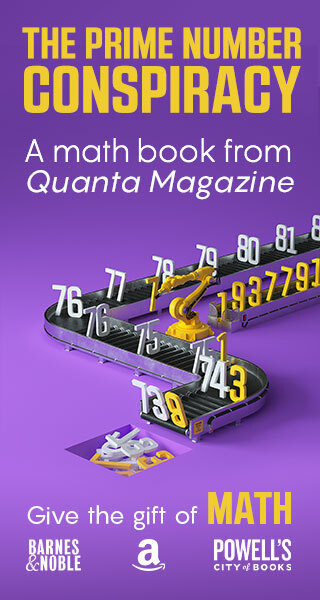 There are fundamental questions, but the observational data has structure on many different levels, and you have to connect phenomena that occur on all those scales. Then it’s not about a hierarchical organizing of what’s the deepest problem, what’s less so, but rather the interconnections. Are you continuing your insider-outsider philosophical project? That training has made me a better scientist because I’m very aware of what I’m actually doing when I’m building a model. When I’m taking a complex physical phenomenon and paring it down, I’m aware of what I have labeled as extraneous and what I have labeled as essential, and why — whether it’s intuition, training, something about the mathematics. It’s a different level of engagement with the process. There is an extra enhancement in life for people who are extremely self-aware. I’m also very interested in watching, as an insider, my own experiences, and as an outsider, how the group of scientists operates. How we’re supposed to be open-minded, but we’re not. And what totally gives me the kicks is understanding this process of how a radically new idea gets accepted. The direct-collapse idea is now regarded as the leading theory of supermassive black hole formation in the early universe. What’s that growing consensus based on? There are growing little bits of evidence in support for such a picture. For instance, in a computer simulation, we start with direct-collapse black holes, populate the early universe with them, and then propagate the growth of those galaxies until today, and match them with the quasars that are seen. Hubble’s successor, the James Webb Space Telescope, now set to launch in 2021, will peer deep enough into space and back in time to glimpse galaxies forming in the early universe. Those observations will test the direct-collapse idea, right? Yes. We realized something totally cool: Because the direct-collapse seed started out as an outsize object, the starlight from the surrounding stars will be dim compared to the light generated by gas falling into it. And lucky for us, James Webb is perfectly pitched to see this. Our claim is that if the telescope sees any quasar during the earliest epochs of the universe, it has got to be one of these direct-collapse black holes. It must have been heartbreaking to see its launch pushed back yet again. Delayed gratification! In a way, I’m enjoying this period of not knowing because there’s a possibility that these massive seeds don’t exist, and that would be heartbreaking too. I’ve told myself, “OK, Priya, if they don’t find them, then you’ve still got to count yourself lucky to be born at a time when, within one lifetime, you could have learned all about black holes, come up with an original idea, made a prediction, and someone took it seriously enough and tested it. OK, it was not right. But all of this unfolding within your lifetime — think how cool that is!” So I’m trying to tell myself that even that would be a supercool outcome. But finding them would be just so awesome.